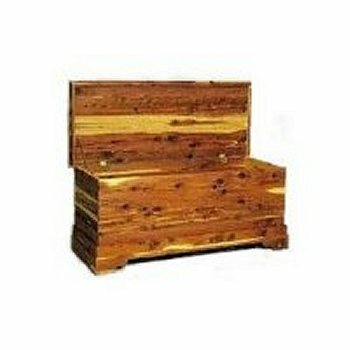 Cedar Chest, Click Image To View Complete Product Inforamtion And Larger Image. Sorry This Product Is Temporarily Out Of Stock! Made of 100% Southern Red Cedar, this chest will not only protect your clothing and blankets with the wonderful smell of cedar, it can hold a lifetime of memories that can be passed on for generations. This is the type of cedar chest that was made by country mountain families to protect their winter clothing. Many of these "made on the place" chest still exist in families today and are priceless family heirlooms. Made on the place was the term used to describe furniture that was handmade on the farm. 20 in. tall by 48 in. long by 20 in. deep.